The U.S. Consumer Products Safety Commission issued a recall alert on February 17, 2017. Repair: Consumers should immediately stop using their Click & Go receiver mounts and contact Britax for a free repair kit for single strollers. Owners of the recalled double strollers should stop using them with car seats attached. Consumers can continue to use their stroller or car seat independently without the car seat attached to the stroller. Britax online at www.us.britax.com and click on the Safety Notice on the homepage or visit us.britax.com/recall, call toll-free at 844-227-0300 from 8:30 a.m.to 7 p.m. ET Monday through Friday and from 9 a.m. to 3 p.m. ET Saturday or email Britax at stroller.recall@britax.com. Incidents/Injuries: Britax has received 33 reports of car seats unexpectedly disconnecting from the strollers and falling to the ground, resulting in 26 reports of injuries to children, including scratches, bruises, cuts and bumps to the head. 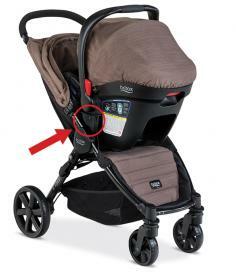 In addition, Britax is aware of 1,337 reports of strollers with damaged Click & Go receiver mounts.